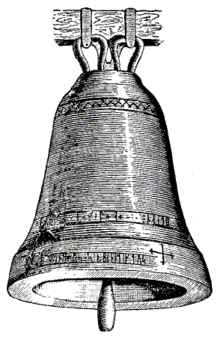 Cutaway drawing of a church bell, showing construction. A church bell is a bell which is rung in a church either to signify the hour or the time for worshippers to go to church, perhaps to attend a wedding, funeral, or other service, or is used within the liturgy of the church service. In Christianity, many Anglican, Catholic, and Lutheran churches ring their church bells from belltowers three times a day, at 6:00 a.m., 12:00 p.m. and 6:00 p.m., summoning the Christian faithful to recite the Lord’s Prayer, or the Angelus, a prayer recited in honour of the Incarnation of God. Bells are commonly rung in celebration, such as after a wedding or service of thanksgiving, and sometimes (usually just a single bell) after funerals as the coffin leaves or is interred. Before modern communication methods, in small communities church bells were the common way to call the community together for all purposes, both sacred and secular. 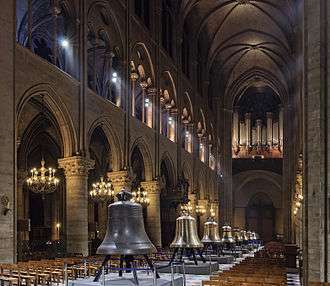 The new bells of Notre Dame de Paris on display in the nave in February 2013 before being hung in the towers of the cathedral. In Christianity, many Anglican, Catholic, and Lutheran churches ring their church bells from belltowers three times a day, at 6:00 a.m., 12:00 noon and 6:00 p.m., summoning the Christian faithful to recite the Lord’s Prayer, or the Angelus, a prayer recited in honour of the Incarnation of God. The injunction to pray the Lord's prayer thrice daily was given in Didache 8, 2 f., which, in turn, was influenced by the Jewish practice of praying thrice daily found in the Old Testament, specifically in Psalm 55:17, which suggests "evening and morning and at noon," and Daniel 6:10, in which Daniel prays thrice a day. As such, the Catechism of the Catholic Church states that the Early Church prayed the Lord's Prayer thrice a day, supplanting the former Amidah predominant in the Hebrew tradition. In the Book of Common Prayer, the Daily Office, which is central to Anglican spirituality, also includes the Lord's Prayer, along with "a selection from the Psalter, readings from the Holy Scriptures, [and] one or more canticles." Many Protestant Churches ring church bells during the congregational recitation of the Lord's Prayer, after the sermon, in order to alert those who are unable to be present to "unite themselves in spirit with the congregation." In addition, most Christian denominations ring church bells to call the faithful to worship, signaling the start of a mass or service of worship. In many historic Christian Churches, church bells are also rung during the processions of Candlemas and Palm Sunday; the only time of the Christian Year when church bells are not rung include Maundy Thursday through the Easter Vigil. The Christian tradition of the ringing of church bells from a belltower is analogous to the Islamic tradition of the adhan from a minaret. 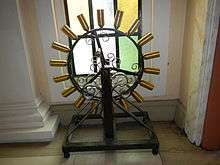 The sacring ring or Gloria wheels used at the St. Jude Thaddeus Church in the former Spanish colony of the Philippines. In the Roman Catholic Church and some Lutheran and Anglican churches a small hand bell or set of such bells (called altar bells, or sanctus bells) is rung shortly before the consecration of the bread and wine into the Body and Blood of Christ and again when the consecrated elements are shown to the people. 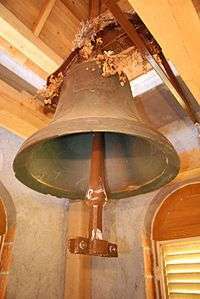 The term "Sanctus bell" traditionally referred to a bell suspended in a bell-cot at the apex of the nave roof, over the chancel arch, or hung in the church tower, in medieval churches. This bell was rung at the singing of the Sanctus and again at the elevation (liturgy) of the elements, to indicate to those not present in the building that the moment of consecration had been reached. The practice and the term remain in common use in many Anglican churches. Sacring rings or "Gloria wheels" are commonly used in Catholic Churches in Spain and its former colonies to replace the tower bells rung during Mass for convenience. 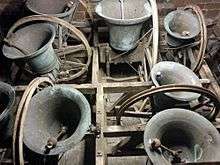 Some church bells are electronically timed to chime automatically. Clocks generally automatically strike, but in the United Kingdom, bells for services, etc., are still almost always rung by people (see bell ringing and carillon). Some churches use recorded or digitally synthesised bells. European Christian church bells typically have the form of a cup-shaped cast metal resonator with a flared thickened rim, and a pivoted metal striker or clapper hanging from its center inside. It is usually mounted high in a bell tower on top of the church, so it can be heard by the surrounding community. The bell is suspended at its apex from a horizontal axle, so it can swing from side to side. A rope is tied to a pulley or lever on the axle, and hangs down to ground level. To ring the bell, the bell-ringer pulls on the rope, swinging the bell. 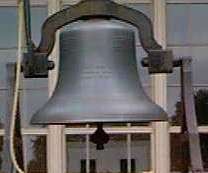 The motion causes the clapper to hit the inside rim of the bell as it swings, making the sound. Alternatively, the bell may be suspended from a stationary support, and the bell rung by pulling a rope attached to the clapper to one side. In some liturgical churches, bells are blessed before they are hung. In the Roman Catholic Church the name Baptism of Bells has been given to the ceremonial blessing of church bells, at least in France, since the eleventh century. It is derived from the washing of the bell with holy water by the bishop, before he anoints it with the oil of the infirm without and with chrism within; a fuming censer is placed under it and the bishop prays that these sacramentals of the Church may, at the sound of the bell, put the demons to flight, protect from storms, and call the faithful to prayer. In the Orthodox Church the ceremony is even more elaborate. A set of bell hammers for the bell of the church at Kovač Hill in Križ, Sevnica (Slovenia). The bell was decorated with a garland due to the solemn blessing of the church. In many Catholic churches, the ringing of a church bell for the Angelus prayer, in the morning, at midday and in the evening, is called the Angelus bell. 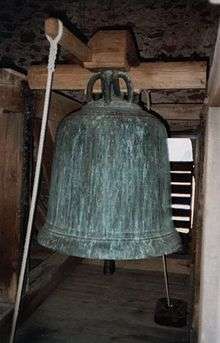 The noon bell was ordered by Pope Callixtus III in 1456, as a support for the Hungarian defenders of Belgrade to encourage their fight against the Ottoman Islamic expansion. The practice of Noon bell is traditionally attributed to the international commemoration of John Hunyadi's victory at Belgrade. The practice and hobby of bell-ringing is sometimes known to non-ringers as campanology. Change ringing is a particular facet of English bellringing where bells are rung in mathematical sequence. Wedding cards commonly show bells: this is founded on the tradition of ringing changes as the wedding couple leave the church. In the Eastern Orthodox Church there is a long and complex history of bell ringing, with particular bells being rung in particular ways to signify different parts of the divine services, Funeral tolls, etc. This custom is particularly sophisticated in the Russian Orthodox Church. Russian bells are usually fixed, and are tolled by pulling on a rope that is attached to the clapper so that it will strike the side of the bell. In many churches the ringing of bells is suspended during Holy Week, to be resumed only at the Paschal Vigil. The ringing of a church bell to announce a death is called a death knell. The type of death knell sometimes depended on the person who had died; for example in the counties of Kent and Surrey in England it was customary to ring three times three strokes for a man and three times two for a woman. In AD 400, Paulinus of Nola introduced church bells into the Christian Church. In AD 604, Pope Sabinianus officially sanctioned their usage. By the early Middle Ages, church bells became common in Europe. They were first common in northern Europe, reflecting Celtic influence, especially that of Irish missionaries. Before the use of church bells, Greek monasteries would ring a flat metal plate (see semantron) to announce services. The signa and campanae used to announce services before Irish influence may have been flat plates like the semantron rather than bells. The oldest surviving circle of bells in Great Britain is housed in St Lawrence Church, Ipswich. The oldest church bell in the world is one donated by Despot Alexius Slav to the metropolitan church in Melnik, Bulgaria, and dated to 1211-1216. It is now kept at the National Museum of History in Sofia. In World War II in Great Britain, all church bells were silenced, to ring only to inform of an invasion by enemy troops. Ringing the bells at Ipatiev Monastery in Kostroma, Russia. The full-circle bells of St Bees Priory shown in the "up" position. Wikimedia Commons has media related to Church bells. ↑ Church Words: Origins and Meanings. Forward Movement. 1 August 1996. Retrieved 16 August 2012. There are two sorts of liturgical bells in the history of the Christian Church-church bells in spires or towers used to call the faithful to worship, and sanctuary bells used to call attention to the coming of Christ in the Holy Eucharist. 1 2 Matthew: A Shorter Commentary. Continuum International Publishing Group. 2005. Retrieved 16 August 2012. Moreover, the central portion of the Eighteen Benedictions, just like the Lord's Prayer, falls into two distinct parts (in the first half the petitions are for the individuals, in the second half for the nation); and early Christian tradition instructs believers to say the Lord's Prayer three times a day (Did. 8.3) while standing (Apost. const. 7.24), which precisely parallels what the rabbis demanded for the Eighteen Benedictions. 1 2 John P. Anderson (2009). Joyce's Finnegans Wake: The Curse of Kabbalah, Volume 2. Universal Publishers. Retrieved 16 August 2012. The Angelus is a Christian devotion in memory of the Incarnation. Its name is derived from the opening words, Angelus Domini nuntiavit Mariæ. It consists of three Biblical verses describing the mystery, recited as versicle and response, alternating with the salutation "Hail Mary!" and traditionally is recited in Catholic churches, convents and monasteries three times daily, 6:00 a.m., 12:00 noon and 6:00 p.m., accompanied by the ringing of the Angelus bell. Some High Church Anglican and Lutheran churches also use the devotion. 1 2 The Anglican Service Book: A Traditional Language Adaptation of the 1979 Book of Common Prayer, Together with the Psalter Or Psalms of David and Additional Devotions. Good Shepherd Press. 1 September 1991. Retrieved 16 August 2012. The Angelus: In many churches the bell is run morning, noon, and evening in memory of the Incarnation of God, and the faithful say the following prayers, except during Eastertide, when the Regina coeli is said. 1 2 Gerhard Kittel, Gerhard Friedrich (1972). Theological Dictionary of the New Testament, Volume 8. William B. Eerdmans Publishing Company. p. 224. Retrieved 26 October 2012. The praying of the Lord's Prayer three times a day in Did., 8, 2 f. is connected with the Jewish practice --> 218, 3 ff. ; II, 801, 16 ff. ; the altering of other Jewish customs is demanded in the context. 1 2 Roger T. Beckwith (2005). Calendar, Chronology, and Worship: Studies in Ancient Judaism and Early Christianity. Brill Publishers. p. 193. Retrieved 26 October 2012. The Church had now two hours of prayer, observed individually on weekdays and corporately on Sundays – yet the Old Testament spoke of three daily hours of prayer, and the Church itself had been saying the Lord's Prayer three times a day. ↑ James F White (1 September 2010). Introduction to Christian Worship 3rd Edition: Revised and Enlarged. Abingdon Press. Retrieved 12 October 2012. Late in the first century or early in the second, the Didache advised Christians to pray the Lord's prayer three times a day. Others sought disciplines in the Bible itself as ways to make the scriptural injunction to "pray without ceasing" (1 Thess. 5:17) practical. Psalm 55:17 suggested "evening and morning and at noon," and Daniel prayed three times a day (Dan. 6:10). ↑ Catechism Of The Catholic Church. Continuum International Publishing Group. 1999. ISBN 0-860-12324-3. Retrieved 2 September 2014. Late in the first century or early in the second, the Didache advised Christians to pray the Lord's prayer three times a day. Others sought disciplines in the Bible itself as ways to make the scriptural injunction to "pray without ceasing" (1 Thess. 5:17) practical. Psalm 55:17 suggested "evening and morning and at noon," and Daniel prayed three times a day (Dan. 6:10). ↑ An Episcopal Dictionary of the Church. Church Publishing, Inc. 1999. Retrieved 26 October 2012. Participation in the Daily Office is at the heart of Anglican spirituality. It is proper form of daily public worship in the Church. In addition to forms for Daily Morning Prayer and Daily Evening Prayer in contemporary and traditional language, the BCP section for the Daily Office includes forms for Noonday Prayer, Order of Worship for the Evening, Compline, and Daily Devotions for Individuals and Families. These offices include prayers, a selection from the Psalter, readings from the Holy Scriptures, one or more canticles, and the Lord's Prayer. 1 2 The New Schaff-Herzog Encyclopedia of Religious Thought: Basilica-Chambers, Volume 2. Kessinger Publishing. 1 June 2006. p. 36. Retrieved 26 October 2012. The main use of bells has always been to announce the time of public worship. It is also a common Roman Catholic practise to ring the church bell at the consecration in the mass, as in some Protestant localities at the Lord's Prayer after the sermon, that those who are absent may unite themselves in spirit with the congregation. ↑ The Valley's Legends & Legacies IV. Quill Driver Books. 30 May 2002. p. 223. Retrieved 26 October 2012. At the end of the sermon, both bells began to ring and continued ringing through the Lord's Prayer. ↑ Church Words: Origins and Meanings. Forward Movement. 1 August 1996. Retrieved 16 August 2012. It became customary to ring the church bells to call the faithful to worship and on other important occasions, such as the death of a parishioner. ↑ Church Words: Origins and Meanings. Forward Movement. 1 August 1996. Retrieved 16 August 2012. It is also traditional that the church bells ring during the processions of Candlemas (the Feast of the Purification) and Palm Sunday. ↑ Church Words: Origins and Meanings. Forward Movement. 1 August 1996. Retrieved 16 August 2012. It is traditional that no bells be rung from the last service on Maundy Thursday until the Great Vigil of Easter. ↑ Church Words: Origins and Meanings. Psychology Press. 1 August 1996. Retrieved 16 August 2012. But even for Muslims who pray infrequently, the adhan marks the passage of time through the day (in much the same way as church bells do in many Christian communities) and serves as a constant reminder that they are living in a Muslim community. ↑ Islamic Beliefs, Practices, and Cultures. Marshal Cavendish. 1 September 2010. Retrieved 16 August 2012. Muslims living in predominantly Islamic lands, however, have the benefit of the call to prayer (adhan). In the same way that much of the Christian world traditionally used bells to summon the faithful to church services, so the early Muslim community developed its own method of informing the community that the time for prayer had arrived. ↑ Herrera, Matthew D. (2005). Sanctus Bells. Their History and Use in the Catholic Church. Adoremus Bulletin. Retrieved on 2014-11-11. ↑ Kathy Luty, David Philippart (1997). Clip Notes for Church Bulletins - Volume 1. The first known use of bells in churches was by a bishop named Paulinus in the year 400. 1 2 Roger J. Smith (1997). "Church Bells". Sacred Heart Catholic Church and St. Yves Mission. Bells came into use in our churches as early as the year 400, and their introduction is ascribed to Paulinus, bishop of Nola, a town of Campania, in Italy. Their use spread rapidly, as in those unsettled times the church-bell was useful not only for summoning the faithful to religious services, but also for giving an alarm when danger threatened. Their use was sanctioned in 604 by Pope Sabinian, and a ceremony for blessing them was established a little later. Very large bells, for church towers, were probably not in common use until the eleventh century. ↑ Henry Beauchamp Walters (1908). Church Bells. p. 4. ↑ Worthington, Mark (10 September 2009). 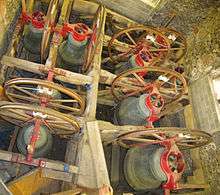 "Oldest ring of bells played again". BBC News. Retrieved 2009-09-10.